Our family just hosted a garage sale. Yes, a garage sale, that American, homegrown, one-of-a-kind, iconic, neighborhood tradition. I'm not a big fan of garage sales as they take a lot of work and patience. But, it has been about a decade since our last one, we have a ton of stuff from raising two nearly grown girls, and my wife is a taskmaster. It made sense to have a garage sale and I reluctantly agreed to look at it from an optimistic opportunity to learn more about people and culture. I sat quietly and interacted intermittently with our makeshift retail establishment visitors over a two day period. Lisa, my wife and CEO of the garage sale, was really in charge and managed the affair. I learned a lot, though, from what I witnessed during our garage sale. And, I think these takeaways tell us as a lot about people and culture today that can be applied to our thinking about schools and colleges. People Want Community. People seek to belong to a community and connect with each other. I would estimate that 80% of the people coming to the garage sale were there to meet us and connect as much as shop for something. Sure, they shopped for stuff, but I got the sense that it was connection that they sought as much as anything. People Like Diversity. Every walk of life entered our storefront. If you have seen the show "Portlandia" on television, then you might be able to imagine the diversity of our retail visitors. We connected with wealthy, poor, and middle class people. Every car from luxury autos to old beaters pulled up in front of our house. At least four different languages were spoken outside of English. Diversity did not scare people - they embraced it. Sustainability is Not New. 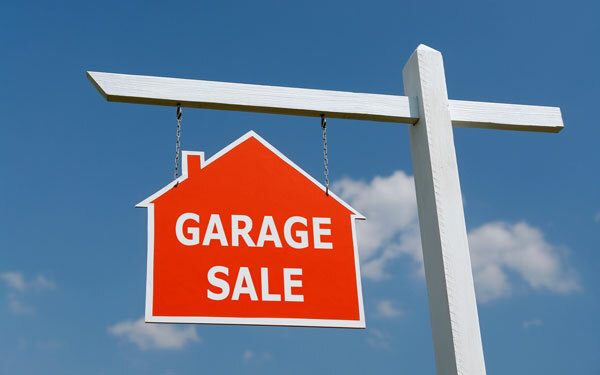 A garage sale is among the oldest forms of entrepreneurial sustainability. Had our spring and summer cleaning been up to me, we would have taken all of our stuff to Goodwill, Northwest Children's Outreach, and then to the landfill. Sure, we will still take many things for gift-in-kind donations to our favorite charities, but with a garage sale we had the opportunity to see several features of sustainability come to life. Reuse. Recirculate. Redistribute. Repurpose. Reconnect. What was old for us was new for someone else. There was an economic exchange - albeit small - and, more importantly, a cultural exchange. We got to know our neighbors - and their dogs - and our extended Garden Home community in Southwest Portland much better. Sustainability is not new. It is simple. "The more things change, the more they stay the same." This old line is very true. I learned a lot from our garage sale. No, I would rather not host one for awhile again. Another decade will be fine for me. But, it was a great experience, thanks to my wife, who is organized and energetic about such things. More importantly, I had the opportunity to witness some simple and basic axioms about people and culture that apply to nearly every aspect of my work. People want community, embrace diversity more than we think, and sustainability is much more simple than we give it credit.